It is very common to receive an invoice after a HITECH medical records request that does not properly reflect the HITECH rates. Medical providers and third-party companies that produce medical records have a financial incentive to take advantage of patients and their attorneys by attempting to over charge for medical record production. 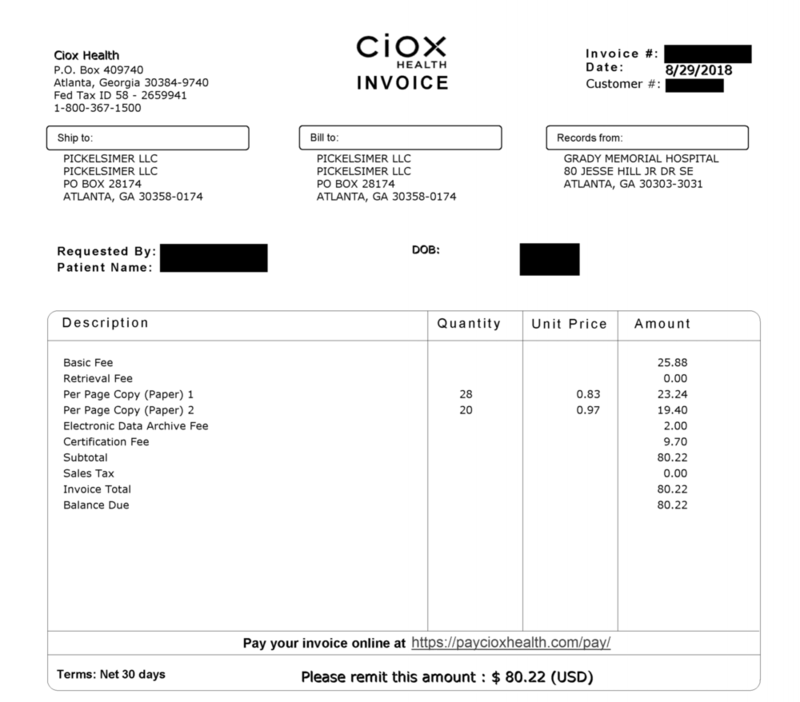 Ciox Health, one of the third-party medical records vendors, felt so strongly that they should be able to charge as they please that they initiated a federal lawsuit attempting to stop enforcement of federal law! That case, Ciox Health, LLC v. Hargan, can be found HERE. Below is a recent non-complaint invoice that this firm recently received. Charging additional fees, for example retrieval fees, access fees, inventory fees, etc. Often a phone call or simple letter advising the medical provider that they are in violation of HITECH will make the provider adjust their medical record charges. If the medical provider fails to respond to the violation letter or refuses to adjust the medical records invoice to properly reflect HITECH rates, then you will have to escalate the matter and file a complaint with your local Department of Health and Human Services Office of Civil Rights (“DHHS-OCR”) office. A health care provider must take action to enforce compliance by their records vendors. Once made aware of a HITECH violation, a health care provider must take “reasonable steps to…end the violation.” See id. If they are unsuccessful, they are expected to terminate the contract or agreement with the contractor. Id. In some regions, DHHS can act within three to six months. In other regions, DHHS may take up to eighteen months. However, DHHS often takes action to enforce compliance before the investigation and final decision is reached. DHHS often intervenes with health care providers and health systems to encourage compliance in advance of investigatory outcomes. This can include sending staff to implement compliance policies at records contractors and with in-house records custodians. Puts health care providers on notice that they must take action to comply with your client’s request. 3. Be filed within 180 days of when you knew that the act or omission complained of occurred. OCR may extend the 180-day period if you can show "good cause." Note: Using this option allows you to include any correspondence with the health care provider or records contractor. You do not need to use one of the official complaint forms (online or in print) to file a complaint on your client’s behalf. You have the option of submitting a complaint in any format you choose. Name and address of health care provider or business associate violating the HITECH Act.